Download the articles before 30 November while they’re free to access! In celebration of this year’s APPAM theme of why measurement matters, we bring you the latest and best of our research on evidence-based policy. From our prize-winning article on Evidence translation: an exploration of policy makers’ use of evidence by Jo Ingold and Mark Monaghan, which defines a new conceptual model of evidence translation illuminating the role of evidence in policy making, to new perspectives on deliberative democracy through the lens of interpretive research methods from Selen Ercan et al in their article Studying public deliberation after the systemic turn: the crucial role for interpretive research. Plus much more besides. For anyone involved in the study of evidence-based policy, this collection is a must-read so download it now while it’s free to access before 30 November! 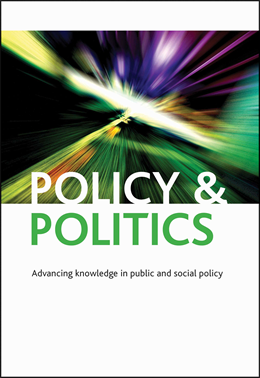 Also, our most recent special issue on Policy Failure is free to access from 1-30 November. Hear from Guest Editor, Professor Claire Dunlop, on why learning from policy failure is so important and what motivated her to produce this special issue. Authors: Newman, Joshua; Bird, Malcolm G.